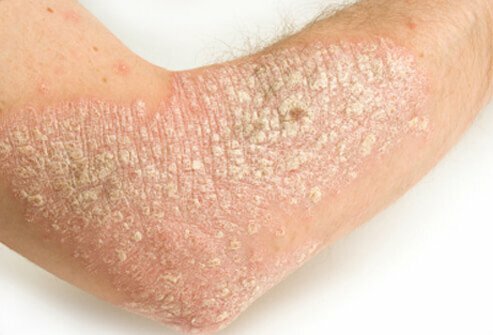 What Are Plaque Psoriasis Causes and Risk Factors? What Are Plaque Psoriasis Symptoms and Signs? When Should Someone Seek Medical Care for Plaque Psoriasis? What Tests Do Health Care Professionals Use to Diagnose Plaque Psoriasis? What Is the Medical Treatment for Plaque Psoriasis? Are There Plaque Psoriasis Home Remedies? What Are Medical Treatments and Medications for Plaque Psoriasis? What Is the Prognosis of Plaque Psoriasis? Is It Possible to Prevent Plaque Psoriasis? Where Can People Find More Information on Plaque Psoriasis? Plaque psoriasis is an inherited systemic inflammatory disease of immune dysfunction that causes plaques of elevated, scaling, inflamed skin that is often quite itchy. The plaques are characteristically found on the scalp, elbows, and knees. Plaque psoriasis is relatively common; about 2%-3% of population of the United States is affected. It is not contagious. Like many other diseases, there is a significant interplay of genetic and environmental factors. Certain mutations pave the way for the development of the disease. It seems likely that more than one mutation in more than one gene must be present simultaneously to develop psoriasis. Once the genes are inherited, some sort of environmental factor is necessary to activate it. Such a factor could be a common viral or bacterial infection or even a simple injury. The characteristic signs and symptoms of psoriasis are small scaly, red bumps. These bumps generally join together into elevated plaques of skin and most often are visible on the elbows, knees, and scalp, although any area of skin can be involved. Frequently, these plaques are quite itchy. Rarely, most of the patient's skin surface is affected. Most dermatologists are able to confirm the diagnosis of psoriasis. The physician can provide helpful suggestions on how to minimize exacerbations of the condition and treatment options. In minimal disease, over-the-counter medications may be sufficient to control the condition. In more severe, extensive, and perhaps debilitating disease, physicians have a variety of treatments that can lessen but not permanently cure psoriasis. Usually dermatologists and most primary-care professionals are able to diagnose classical psoriasis on the basis of the appearance of the individual lesions, the tendency to form plaques, and the distribution of those plaques on the elbows, knees, and scalp. Psoriasis can affect one or all the nails of the fingers and toes, causing changes that resemble fungal infections. Psoriasis rarely involves the lips or mouth. Occasionally, atypical psoriasis may require a biopsy (a small piece of surgically removed involved skin) to be examined under the microscope to supplement the clinical evaluation. Blood tests are rarely helpful to confirm or support the diagnosis. It must be remembered that psoriasis is a chronic health condition that is not curable in the usual sense. The disease is characterized by exacerbations and remissions that often seem to occur spontaneously. Patients often relate some incidental environmental event or psychological stress to changes in their disease's activity. This can complicate treatment. Since psoriasis is incurable, doctors treat the condition to enhance the patient's sense of well-being and independence. Treatment options are chosen that are appropriate to the severity of the condition. Mild, localized psoriasis is treated with topical therapy while more extensive, severe disease will require systemic, expensive, and potentially hazardous treatment. The good news is that there is a lot that can be done for mild cases of psoriasis. There are many over-the-counter products available that are effective for psoriasis -- 1% hydrocortisone cream (Cortaid, CaldeCort) is very safe topical steroid that can suppress mild disease. Preparations containing tar (that gunky, smelly stuff that is a byproduct of oil extraction) can be beneficial. Tar can be found in many ointments and shampoos so it can be effective in treating scalp disease. Sunlight has well-documented beneficial effects on psoriasis. Careful sunbathing (no sunburns) can be quite effective in controlling the disease during seasons when sunlight is abundant and the weather is tolerable. When treating this disease, it must be remembered that topical medications and light will have difficulty penetrating through thick layers of scale. This scale must be removed by gentle washing techniques so as to minimize irritation. In plaques of psoriasis, the small cutaneous vessels are very close to the surface of the skin, just under the scale. If the scale is removed, bleeding may occur, producing irritation and trauma that actually tends to activate psoriasis. Topical medications effective for psoriasis available by prescription include those that contain topical steroids of various potencies. Typical steroid medications are halcinonide (Halog, Halog-E), flurandrenolide (Cordran, Cordran SP, Cordran Tape), betamethasone (Luxiq), desonide (Desonate), alclometasone (Aclovate), mometasone (Elocon), fluocinonide (Vanos), and triamcinolone acetonide (Kenalog). Tar-containing topicals and vitamin D-like molecules (calcipotriol [Taclonex]/calcipotriene [Dovonex]) also can be helpful. Ultraviolet light administered under controlled conditions in a physician's office in various wavelengths (narrow-band UVB) with or without supplemental medication (8-methoxypsoralen) (PUVA treatment) is a very effective therapy. Systemic therapies include a vitamin A-like drug, acitretin (Soriatane), short-term cyclosporine (Gengraf, Neoral, Sandimmune) therapy for severe flares, and methotrexate (Rheumatrex Dose Pack, Trexall). A new oral drug, apremilast (Otezla), has recently become available that seems to work best for mild to moderate psoriasis. New and expensive targeted drugs called biologics, which include etanercept (Enbrel), adalimumab (Humira), infliximab (Remicade), ustekinumab (Stelara), secukinumab (Cosentyx), and ixekizumab (Taltz), are now available. These newer products are produced by new technologies requiring their synthesis by living cells. They are proteins and all currently must be given by injection at various intervals into the subcutaneous tissue by the patient or by intravenous infusion in a medical facility. They are unique in that they have precise targets in the in the inflammatory pathway that they block. Since the biologics are very, very specific in their mode of action, they claim to offer increased safety and improved efficacy over older less specific immunosuppressive drugs. All of these treatments must be continued indefinitely because when they are stopped, the psoriasis will typically return. It has recently been appreciated that the presence of psoriasis is a sign of a systemic inflammatory predisposition. Patients with psoriasis are predisposed to being obese, having diabetes, and having a destructive arthritis and premature cardiovascular disease. If treated, it is reasonable to expect that individual plaques of psoriasis will diminish or disappear. It is also expected that new lesions will develop if treatment is abandoned. The best way for a patient with known psoriasis to prevent its reappearance or exacerbation is to treat the skin with care and avoid traumatic stimuli like sunburns or elective surgical procedures. It is important to avoid picking or rubbing off the scale. Picture of plaque psoriasis on the elbow. Plaque psoriasis is the most common type of psoriasis. Image courtesy of Hon Pak, MD. Plaque psoriasis. Image courtesy of Hon Pak, MD. Plaque psoriasis. Photo courtesy of University of British Columbia, Department of Dermatology and Skin Science. Picture of plaque psoriasis. Photo courtesy of University of British Columbia, Division of Dermatology. Psoriasis on the palms. Image courtesy of Hon Pak, MD. Plaque psoriasis with fissures, which are splits in the skin. Fissures usually occur where the skin bends (joints). The skin may bleed and is more susceptible to infection. Image courtesy of Hon Pak, MD. Plaque psoriasis on the back. Image courtesy of Hon Pak, MD. Severe plaque psoriasis. Note the classic red color and scales or plaque. Image courtesy of Hon Pak, MD. Nail psoriasis. Note the classic pits and yellowish color in the nails. Image courtesy of Hon Pak, MD. Psoriasis of the scalp. Image courtesy of Hon Pak, MD. Think you know everything there is to know about psoriasis? Take our quiz to test your psoriasis IQ. Boehncke, Wolf-Henning, and Michael P. Schön. "Psoriasis." The Lancet May 27, 2015. 1-12. Greb, Jacqueline E., et al. "Psoriasis." Nature Reviews Disease Primers 2 (2016): 1-17. Menter, Alan, et al. "Guidelines of Care for the Management of Psoriasis and Psoriatic Arthritis." J Am Acad Dermatol 58.5 May 2008: 826-850. Weigle, Nancy, and Sarah McBane. "Psoriasis." American Family Physician 87.9 May 1, 2013: 626-633. What are the symptoms and signs of your plaque psoriasis? Have any treatments been effective for your plaque psoriasis?